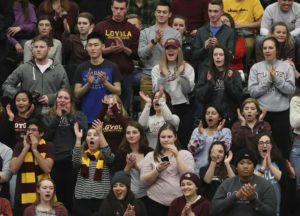 This season, the Loyola women’s basketball team (17-4, 8-2) recruited six new players, including five first-years. First-year guard Ellie Rice is one of the new players and she’s been an asset to the team, averaging 7.0 ppg in the season, while averaging 9.5 ppg and 5.7 rpg over her last four games. Rice said she started playing organized basketball in third grade and attributes her love of the sport to her brothers. Rice’s collegiate career started when head coach Kate Achter realized she would need more players to replace the graduating seniors. Achter said she saw Rice’s potential when she was averaging 20.7 ppg her senior year of high school at Regents School of Austin in Austin, Texas. Rice said she’s happy to be at Loyola and she’s excited to see how far she’ll go. She said she’s already met many of her goals, such as a strong rebound presence and playing aggressively, and she’s eager to keep pushing past boundaries. Rice is the second Texas recruit in program history, according to the athletics department. 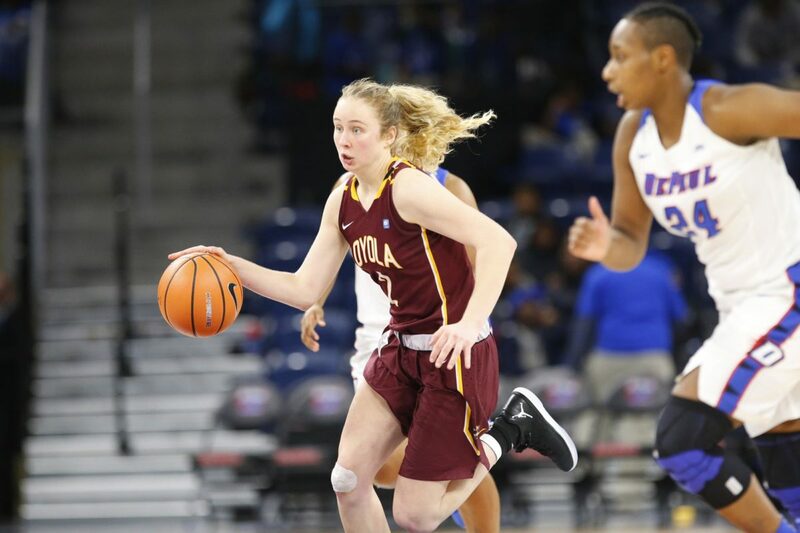 Grace Goodhart was a McDonald’s All-American from Texas and was on the 2015 MVC All-Freshman team before transferring to the University of North Texas. Rice said she chose Loyola because she liked the chemistry between the coaches and players on the team. Rice said she was nervous about the transition from high school to college, but she’s grateful for her teammates and the fact that she’s able to rely on them. While she was excited to join the team, Rice said she was apprehensive about how the other players would react to her, but those worries were eased and she described the team as being like sisters. “I was a little nervous coming that I’d be that new freshman, but they were all super welcoming and they’ve become some of my best friends,” Rice said. Not only have her teammates helped with her transition, but Rice said they make playing at this level more relaxing. In high school, Rice didn’t have a tough player down low to give the ball to. In college, having a player who can post up by the basket takes pressure off Rice and the other guards. First-year forward Kat Nolan said she loves playing with Rice because she brings a light-heartedness to the team without losing focus from the game. Achter said Rice has been a great addition and her energy has been enjoyable to watch. She also said Rice is influential both on and off the court. Rice and the Ramblers are scheduled to play Valparaiso University Feb. 11 at Gentile Arena.